Greenhills Herald: Another Music Dept. Triumph!! Anyone who has heard the school choir's rendition of 'Africa' will not be surprised that they won a major trophy last monday in the National Concert Hall!!! Well done to all! What a performance! What an arrangement!! 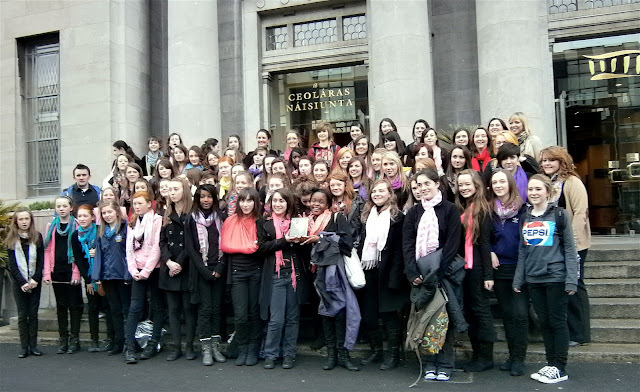 On Monday 16th April, Our Lady’s College, Greenhills choir headed out in great excitement in our groups, the ‘Larks’ and ‘Legends’, to the National Concert Hall after being put through to the Walton’s Music for Schools Competition. Our school was one of six post-primary schools in the country to be put through to sing in the National Concert Hall, this being a huge achievement already. We left the school at 7.30 to have a sound check in the National Concert Hall at 9.15 and then were let explore Dublin for the morning. We were back in the concert hall for 12.15 and seated for the beginning of the show! The show consisted of twelve schools in total: 6 primary school and 6 post-primary schools. Throughout the duration of the show we heard a wide variety of musical talents, ranging from traditional ensembles to more modern pieces. The atmosphere in the venue was brilliant and it was great to see so much support from many of the parents, who travelled down to Dublin for the event! Against very tough competition, we were determined to put on our best performance of ‘Africa’ by Toto yet. Conducted by Ms. Diskin and accompanied by Mr. Reilly on guitar, Orlagh Gaynor on bass and Aoife Mc Donagh, Eleanor Rogers and Ms. Treadwell on percussion, we were extremely proud of our performance and hoped it was enough to get us ranked in the top 3 post-primary schools in the country. We knew we had achieved a great thing having been given the privilege to sing in the National Concert Hall, but our hopes were still high to be crowned first in Ireland and we are absolutely delighted to say we were! We celebrated in true Greenhills spirit when the results were called... a few tears were even shed! Not only were we extremely excited to be placed first, but are so happy to have won €3000 worth of music equipment for our school! We are very proud to call ourselves the ‘best choir in Ireland’ and would like to give a huge thank you to Ms. Diskin, Mr. Reilly and Ms.Treadwell. It wouldn’t have been possible without them and their dedication and commitment to choir, as well as their creativity and enthusiasm is what gives us these amazing opportunities!